Cryopreservation is the use of very low temperatures to preserve structurally intact living cells and tissues. 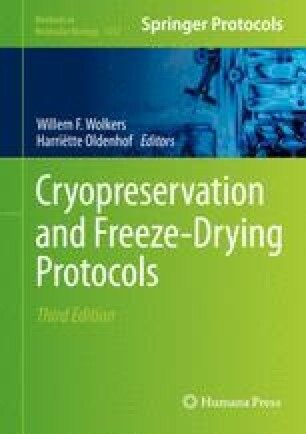 Unprotected freezing is normally lethal and this chapter seeks to analyze some of the mechanisms involved and to show how cooling can be used to produce stable conditions that preserve life. The biological effects of cooling are dominated by the freezing of water, which results in the concentration of the solutes that are dissolved in the remaining liquid phase. Rival theories of freezing injury have envisaged either that ice crystals pierce or tease apart the cells, destroying them by direct mechanical action, or that damage is from secondary effects via changes in the composition of the liquid phase. Cryoprotectants, simply by increasing the total concentration of all solutes in the system, reduce the amount of ice formed at any given temperature; but to be biologically acceptable they must be able to penetrate into the cells and have low toxicity. Many compounds have such properties, including glycerol, dimethyl sulfoxide, ethanediol, and propanediol. In fact, both damaging mechanisms are important, their relative contributions depending on cell type, cooling rate, and warming rate. A consensus has developed that intracellular freezing is dangerous, whereas extracellular ice is harmless. If the water permeability of the cell membrane is known it is possible to predict the effect of cooling rate on cell survival and the optimum rate will be a trade-off between the risk of intracellular freezing and effects of the concentrated solutes. However, extracellular ice is not always innocuous: densely packed cells are more likely to be damaged by mechanical stresses within the channels where they are sequestered and with complex multicellular systems it is imperative not only to secure cell survival but also to avoid damage to the extracellular structure. Ice can be avoided by vitrification—the production of a glassy state that is defined by the viscosity reaching a sufficiently high value (~1013 poises) to behave like a solid, but without any crystallization. Toxicity is the major problem in the use of vitrification methods. Whether freezing is permitted (conventional cryopreservation) or prevented (vitrification), the cryoprotectant has to gain access to all parts of the system. However, there are numerous barriers to the free diffusion of solutes (membranes), and these can result in transient, and sometimes equilibrium, changes in compartment volumes and these can be damaging. Hence, the processes of diffusion and osmosis have important effects during the introduction of cryoprotectants, the removal of cryoprotectants, the freezing process, and during thawing. These phenomena are amenable to experiment and analysis, and this has made it possible to develop effective methods for the preservation of a very wide range of cells and some tissues; these methods have found widespread applications in biology and medicine.